Stream gaging sure was a dapper occupation at the turn of the century! Here's the various techniques United States Geological Survey hydrologists used to measure current without even dipping a toe into the streams and rivers. 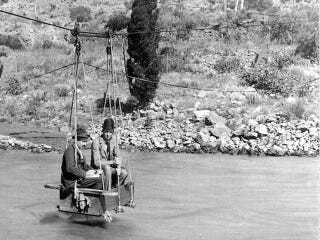 These dapper lads are a pair of United States Geological Survey hydrologists measuring the current flow of the Arkansas River from a cable-suspended stream-gaging car in 1890. These hydrologists were hard at work measuring the velocity of water within the Arkansas River near Cañon City in Fremont County of Colorado. Their photograph was included in the 1901 United States Geological Survey water supply paper 56, Methods of stream measurement, along with an entire collection of downright dashing scientists modelling field techniques. Other techniques described by author Frederick Haynes Newell include measuring from bridges, ferries, the shoreline, and even specialized dams called weirs.